If you are ready to take the next step in controlling your psoriasis using a psoriasis friendly diet plan, you can use all my three eBooks either separately or together to help remove the decision stress at meal times. 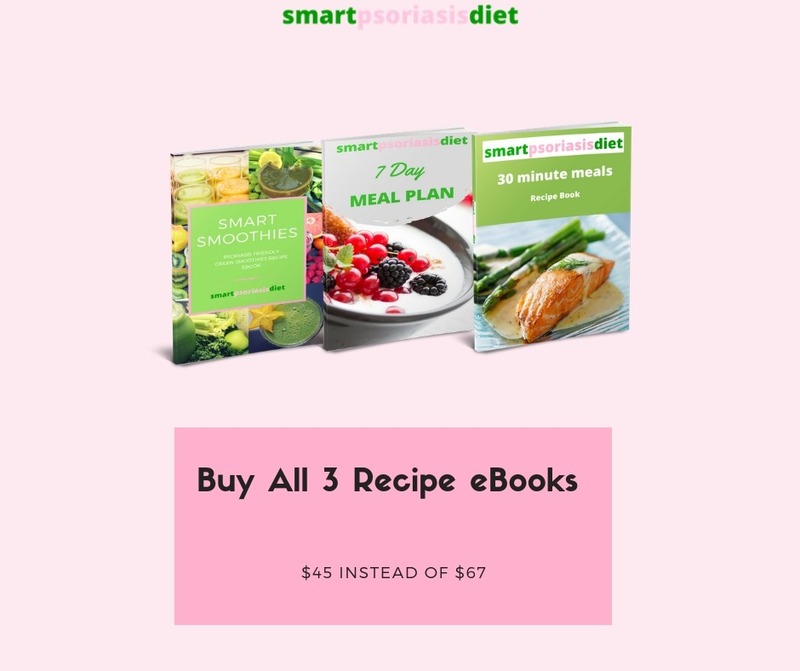 My Smart Psoriasis Diet 30 Minute Meals Recipe eBook is 97 pages long and is my very first published recipe eBook. 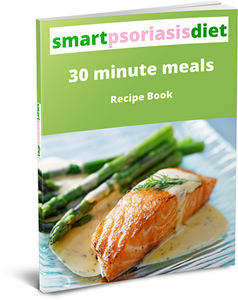 It gives all the tips, tricks and substitution guides that you will need when starting out on a Smart Psoriasis Diet Plan, with the added benefit that all 90+ recipes (breakfast, lunch, dinner, side dishes, dressings, sauces & spices) can be prepared and cooked in 30 minutes or less! 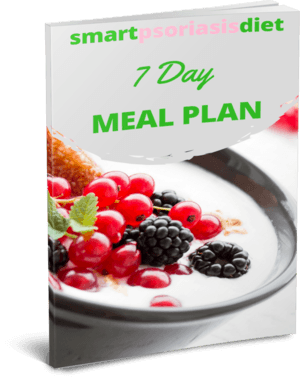 The Smart Psoriasis Diet 7 Day Meal Plan is my second publication, and it contains all my favorite latest recipes into an easy to read seven-day meal plan and shopping list. This can work in conjunction with the 30 Minute Meals Recipe eBook, where you can interchange your favorite recipes, or it can be bought and used on its own. 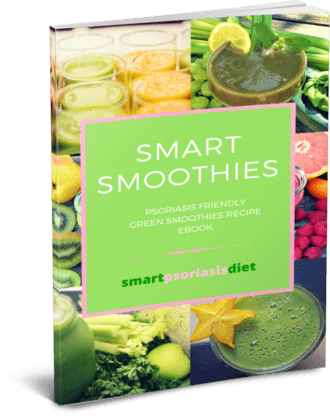 Smart Smoothies For Psoriasis is my latest eBook, and it lists 20 of my all-time favorite heal from the inside green smoothie recipes. When first looking to experiment with a psoriasis friendly diet, I introduced raw veggie shakes, which improved my skin drastically. However, back then, they did not taste great, thankfully over the past few years I have experimented with different combinations to ensure I have the right balance between high alkaline based smoothies but also tasty to drink.